Music consists of three elements: melody, harmony, and rhythm. Of those three, rhythm is the element generally accepted to be the most fundamental and important. Unfortunately, rhythm is also the element that the majority of developing jazz guitarists (and most other instrumentalists) explore the least. Many guitarists have spent years honing the craft of melodic and chordal playing but still have that elusive something missing: the glue that holds everything together as a compelling, coherent musical statement. For many of these players, that missing factor is rhythm. This class will explore rhythm in an in-depth and systematic way. Whether you are a beginning, intermediate, or advanced jazz guitarist, the concepts and exercises presented are designed to supercharge your rhythmic sense and show you how to start thinking about rhythm on the same level that you already think about melody and harmony. In recent years, with jazz musicians incorporating sophisticated polyrhythms, odd and changing meters, and metric modulations into their music, a solid sense of time and a deep understanding of rhythm has become more important than ever for all instrumentalists, not just drummers. 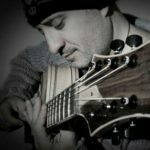 While part 4 of my Modern Jazz Guitar series explored the application of some of these advanced rhythmic ideas to modern-style playing, this class starts with some basic but essential concepts that have always been a crucially important part of jazz and builds on those basics to more sophisticated rhythmic skills. Beginning and intermediate jazz guitarists will benefit from Rhythm Workshop, but advanced players and those who have already been through my MJG part 4 materials will also find new and challenging concepts here. Nice presentation with a lot of helpful exercises that will keep you busy for a long time! Tom offers some excellent suggestions for practicing a swing and straight 8th note feel. I also enjoyed the tips for practicing with the metronome on different beats. The accompanying PDF has a lot of great practice material that will help you to be more specific about what you need to work on. Thank you, Tom. A great class! Simpel and to the point. Im still busy with this one. This class fits perfect for me. I wanted to start with odd groupings, polyrhythem etc. but i didnt have a basic understanding of rhythem, this class gives me this and much more. I never liked swing feel music much but when doing the parts about swing feel i really liked playing it. Rhythem was always something i neglected but now i see how importent it is. Cant wait to have finished this class! I do notice that my timing in rhythem and lead guitar has improved since i started with this class. I have mined a wealth of knowledge from this workshop and highly recommend it. I’ve always felt that rhythm was my weakest area and this has been just what the doctor ordered. I’ve already noticed a significant improvement in my playing (technically and creatively), and as opposed to being dry or boring many of the concepts are also a lot of fun! I honestly feel that it would be a great value at twice the price considering the amount of information it contains and I will definitely be checking out more of Tom’s workshops going forward. There is enough material in this one to keep me busy for quite a while though! Tom did a great job in breaking down the plethora of rhythm permutations in respect to attacks per measure. This also helps me when sight reading so I become comfortable with many types of syncopation. Having a couple of his other courses, I am happy to say this one also delivers quality info to propel your skills forward. I’m very grateful of generous musicians such as Tom who share their wealth of information. Tom has put a lot of work into this class; both in preparing for the class itself, and in thinking about rhythm in general. I think the material here is well presented because of how perfectly he understands it himself. You really get a feeling that he has examined each concept in the finest of detail, and that he has lived with it long enough to have true clarity. While not everyone will find musical use for all the rhythm concepts presented (some of the extensive poly-rythm stuff needs a special group of musicians to play with, and an even more special audience),you will definitely see rhythm differently, and be a better overall player. Beyond the specific examples, I think the true value is in the implied way of thinking about and categorizing rhythm devices. If technical mastery can free expression, Tom will get you there. Just started on the Rhythm Workshop. There is a great depth of information here that is of high value to me. Tom has created an excellent course. The topic of rhythm is so important and to have the swing feel dealt with in depth with so many examples is simply wonderful. This is the third course of Tom’s that I have taken. I have nothing but good to say about his method of instruction. Thanks. I also have been working with this class bit by bit, and like all of Tom’s other classes that I have, this one is incomparable. I agree with Tom that understanding the subtleties of rhythm can add far more to your phrasing, timing, and overall playing than all the other elements of music: harmony, melody. This class will have you appreciating the basics of music more than ever before. I’ve only been working with "Rhythm Workshop" for about two weeks and I’ve already noticed improvement in my improv. I’m an intermediate player; I know my scales, arpeggios, etc. But, my playing hasn’t sounded as good as I would like it to. Tom’s lesson has helped me to become aware of where I’m starting and ending my phrases in the measures. And, consequently, how my phrases can sound completely different depending on what beat I start and end them on! I’m really looking forward to getting deeper into this class! Tom is very clear in his presentation. He makes these concepts easy to understand. I will be buying more of his classes for sure! Thanks Tom!